The planned redesign of Alberta's licence plates has been stopped, premier Jim Prentice announced Thursday afternoon. The province plans to stick with the current "Wild Rose Country" plate. The planned redesign of Alberta's licence plates has been stopped, premier Jim Prentice announced Thursday afternoon. The province plans to stick with the current plate. 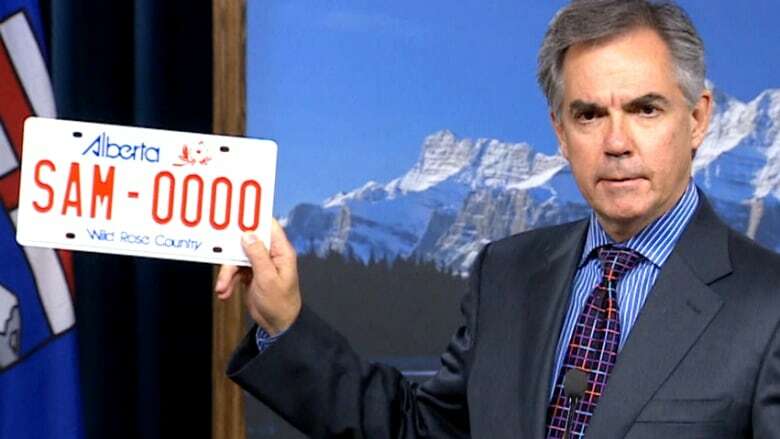 “This is Alberta’s new licence plate,” Prentice said, while holding up the familiar red and white plate. In July, the government announced that for the first time in 30 years the province would get new licence plates. Albertans were asked to vote on a new design, which did not include the current “Wild Rose Country” slogan. However, the three designs that were released — all given to the provincial government for free by the American multi-national 3M — were quickly met with controversy. CBC News reported that 3M hired heavyweight political insider Rod Love to lobby the government for new licence plates. A graphic design firm in Edmonton was so underwhelmed by the proposed designs for the new licence plates that they even decided to make their own. He suggested that "not much money" has been spent on the redesign so far. A spokesperson for the province said the former premier’s office spent $9,745 for initial work on the alternative design. An additional $800 was spent on the survey and original announcement made earlier this summer. Had work started on the newly-designed places in the spring as planned, the cost would have been around $15 million. One of the reasons behind the redesign was to increase visibility for police. Prentice says the government will work with law enforcement to make the current plates easier to see.